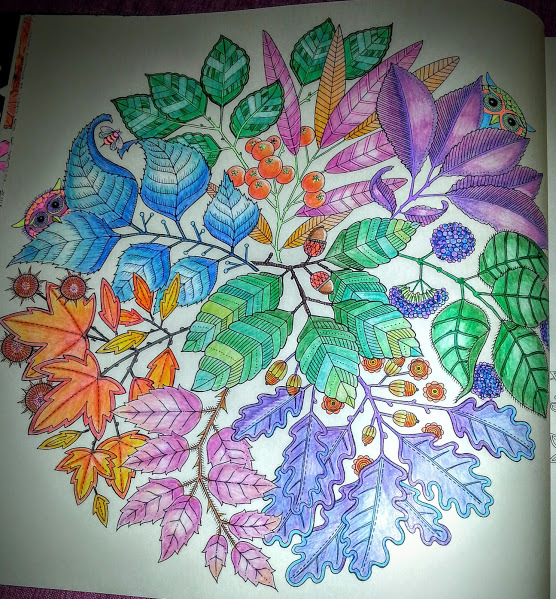 I have a secret love - unfortunately it is not anything that is remotely romantic or exciting but it is something that I find relaxing and strangely satisfying.....Yes it's colouring in. I thought I was the only grown-up in the world who loved spending time choosing colours and finishing pictures but it turns out that there are a lot of us out there. I think my love of colouring in partly stems from my total lack of artistic ability - I can't draw or paint or sculpt or even stick things in straight - see my AntiCraft post! So I take great pleasure in finding a picture that someone else has drawn and colouring it in. It is also a great way to zone out a bit - it seems to use the part of the brain that forgets time and place and I just end up in my own little world. It is a remarkably relaxing break in a stressful life. To my total amazement I read an article in the newspaper several months ago that was all about women in France who have discovered the joys of colouring and have set up facebook pages (with over 1,000 followers) and all sorts of like minded groups who get together to colour-in. They even design their own colouring in books with really complex designs rather than your usual cute animals and fairies that they make for children. Apparently colouring books are more popular than cookbooks over there. So I now feel quite vindicated in my choice of pass-time - although I don't admit it to people because they would still think it is a really strange thing for a grown woman to do. I'm looking forward to having grandbabies one day and I'll be able to buy them colouring in books and textas and colour pencils and we'll be able to colour together. In the meantime, I have a couple of Barbie books, based on the Barbie movies, that my daughter bought for my birthday (Barbie leads a very exciting and colourful life!) And when I get tired of Barbie there's always great pictures on the internet (I just Google "adult colouring in pictures") to print off and indulge myself in colouring occasionally - just to keep my hand in until those grandchildren show up! I think coloring is fun, too! Well, colouring, that is! nice to see you are getting into the Australian spelling Carol - next I'll teach you favourite and neighbourhood that spell check tells me I should spell differently! And I'm glad you're a fan of colouring too! Sounds like grown-up play to me, which is great! I think it's a wonderful pastime - very calming and meditative. I say go for it, and no shame! I love to color too! I also don't have any artistic talent at all! It's very relaxing. I think that's why it appeals Rena - you feel artistic while not being that way at all! Leanne, I love to color too! Finally we can come out into public! Here from the Leisure Link. Leanne, this is so cool! I LOVE coloring! Always have! What a fun hobby! Coloring is very therapeutic. When my kids were younger, my mom would bring over these complicated coloring books and the pages looked like works of art! Thank you for sharing this with #TheLeisureLink.